Three Cedars Press, 9780987923622, 312pp. It's 1899, and the Silk Trains-with their fragile cargo of silk, valued at three quarters of a million dollars-race across the continent to New York. If the thieves don't get to them first. Broke and hungry, gentleman adventurer John Granville finds work guarding the silk trains. His job?-to keep the thieves away. Fleeing his past, Granville can't seem to find a future. Until one of the would-be thieves is found dead in the rail yards. And Granville's friend and fellow gold-seeker Sam Scott is arrested for murder. With the Hanging Judge due back in town any day. To find the killer, Granville dives into the seedy side of the city-the burlesque halls, gambling joints, brothels and opium dens that line reeking mudflats. Along the way he finds companionship in odd places and an ally in Emily Turner, the emancipated daughter of a very Victorian father. Will Granville uncover the truth and find the killer in time to save his friend? 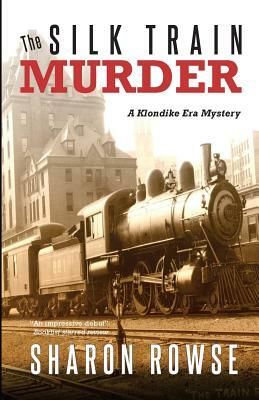 The Silk Train Murder is a historical mystery set on the Northwest Coast during the Klondike Era-when Vancouver and Seattle were gateways for Klondike gold and Chinese silk. ..".an impressive debut...lots of colorful historical detail..."-Booklist (starred review) "Rowse knows her characters-how they think, how they act and interact. ... The chemistry between Turner and Granville is potent and charming, focused more on investigation than romance, but with enough hints of a lasting partnership for future installments. It's just another of the many unexpected pleasures that make Rowse one of Canada's newest mystery writers to watch.."-Quill & Quire (starred review) "Talk about a big, bubbling stewpot of a book ... delicious... Rowse, a first-time novelist, has delivered a wild ride through a colorful, relatively unknown period in North American history, and she's populated it with a host of unforgettable characters. Her protagonist, the Honorable Granville, makes an appealing leading man, and his lady love, the liberated Emily Turner, provides the perfect romantic coda to this rip-roaring adventure." -Mystery Scene Magazine.